Alopecia areata is a common auto immune disease and condition of undetermined etiology characterized by circumscribed, smooth, usually asymmetric areas of baldness on the scalp, eyebrows and bearded portion of face . 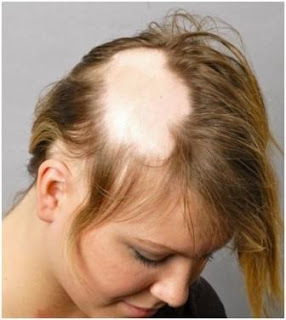 Alopecia areata usually starts with one or more small, round , smooth bald patches on the scalp and progress to total scalp hair loss ( Alopecia totalis) or complete body hair loss (Alopecia Universalis). 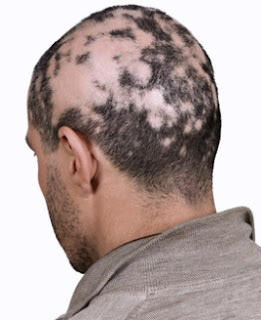 Alopecia Areata is a type of hair loss that occurs when your immune system mistake attacks hair follicles instead of harmful foreign invaders. The damage to follicle is usually not permanent. However the good news is that this condition often respond well to Ayurveda treatment , especially during the early stages, Alopecia areata usually begins when clumps of hair fall out , resulting in totally smooth , round hairless patches on the scalp or other areas of the body. Alopecia areata treatment has been well discribed in classical ancient Ayurveda texts. While no treatment regime can promise a guaranteed cure, at Rudraksha Ayurveda we have got excellent results without side effects with pure ayurveda herbs and ayurvedic treatment for external application. Rudraksha Ayurveda treatment is aimed at treating known causes, immunity restoration, treating the local scalp condition and reducing stress. The combinations of herbs for oral use is decided according to the dosha involved and the cause of the hair fall. As the hair disease are related to the ' the asthi dhatu' or bone tissue so to treat hair loss the medicines which gives strength to the bone are given orally for long term. The herbs are immune modulators are also given to the patients of alopecia araeta for increasing immunity so immune system become strong and hair loss is stopped and start a new hair grow in the follicles. Pitta pacification is the primary ayurvedic hair loss treatment via pitta pacification diet and pitta reducing ayurvedic medications , iron deficiency if exists also has to be corrected. Ayurvedic rasayans preparations for boosting iron level increasing the body immune function and to nourish body tissues including bone tissue is a well regarded method in ayurvedic therapy because ayurveda believes hair and nail as the bi products of bone tissue formation.